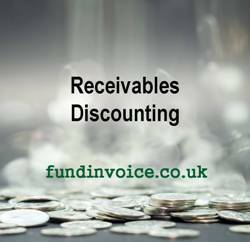 Receivables discounting, sometimes called accounts receivable discounting (or A/R Discounting), is a business financing facility whereby the debts that your customers own you are sold to funder at less than the full face value i.e. at a discount. Receivables means the monies that you are owed by customers. These can be invoices for goods or services that you have supplied, or in the case of the construction sector, it can mean applications for payment (a methodology of requesting payments in stages used by c. 75% of construction sector companies). Discounting means purchasing such a debt at less than its face value. Even if a funder offers 100% prepayments, they will usually deduct their fee from the value of funding that they pay you. The term "receivables" is more commonly used in countries such as USA, and is more usually referred to as invoice finance, factoring or invoice discounting, in the UK, and their are many different types of invoice funding. However, technically A/R discounting is a better umbrella term because the lack of the word "invoice" means it encompasses sectors like construction that don't raise an invoice as such i.e. both invoices and applications for payment can be considered receivables. Discounting tends to suggest purely funding being provided, as opposed to funding and credit control - which is commonly called factoring. So accounts receivables finance is probably the best overall umbrella term for these services, as it can cover all the previously mentioned forms of funding even including selective and spot funding facilites (both refer to arrangements whereby you pick and choose transactions to be funded, rather than submitting them all). I have written previously about how hit and miss it can be, using the internet to try and find these kinds of services. What search engines show you is often highly influenced by either paid advertising or investment in search engine optimisation campaigns - rather than just the best provider to help you find what you need. A quick search online revealed the normal variety of paid advertisers, factoring companies, finance brokers and definition sites competing for the top of the first page in the search engines. As with any search, you will take your chances as to which of these options you select. Received an average customer satisfaction rating of 4.9 out of 5. Been able to find business finance for 97% of companies. Found average savings of 34% on invoice finance prices quotes elsewhere.